From 6th July to 12th July 2016, JAC INTERNATIONAL export team paid a visit to Thailand for an investigation of forklift, outboard motor market. The team is led by He Tao, the general manager, joined by export department members, aiming to expand export business and develop the export of outboard motors. On 6th July, the team visited Mr.Cai Rongzhuang, the chairman of Beijing chamber of commerce in Thailand; Mr. He first introduced the development of JAC motor and JAC INTERNATIONAL during recent years, and then made recommendation of the outboard motor and forklift to Mr. Cai. Chairman Cai presented Thailands current car market, and introduced in details the development of new energy vehicles in Thailand, hoping that JAC MOTORS strengthen the cooperation with the Thai-Chinese Chamber of Commerce Association, and actively participates the new energy automobile market competition in Thailand. Chairman Cai also put forward some good suggestions for outboard motor market. 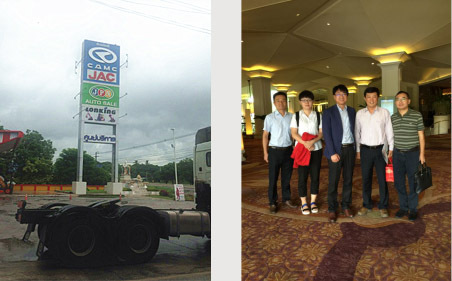 On July 7th, JAC team visited customers in NAKHONSAWAN.The company has its own logistics company and refitting workshop, and they once had business dealings with JAC a few years ago, and highly praised JAC motors. The team made recommendation of the outboard motor and forklift, and the customer was interested in JAC forklift, confirming order of 10 units of forklift at site. On July 8th, they visited Mr. Mai who is the Honorary President of Chinese Enterprise Chamber of Commerce in Bangkok, and recommended JAC products, especially the outboard motors, Mr. Mai interested in China-made outboard motors with high performance and competitive price.Then, Mr. Mai recommended a Thai SUZUKI outboard machine dealers HULL MARINE SERVICE CO., LTD. The team then visited this company and met the purchase manager Ms. Anong Singsena and introduced outboard motors in detail, the manager promised she would recommend this to their subordinate dealers. From July 9th to 11th, JAC team went to Thailand Elephant Island, and met the local government officials in Elephant Island, and made the introduction of JAC outboard motors. As Thailands new tourism destination, Elephant Island’s tourism develops so fast, and has a good market for leisure boats with outboard motors, the magistrate is willing to help and recommend outboard machine product to the local dealers. As for this trip, the team knew clearly the customer specific requirements and characteristics of the local market, got the actual orders, and laid solid foundation for the following export business.